1 of 6 Heat oven to 350 degrees . 2 of 6 Add cold butter to a 10-inch springform pan. Heat in oven until melted, about 3 minutes. Swirl pan to coat bottom with melted butter. Sprinkle evenly with brown sugar. 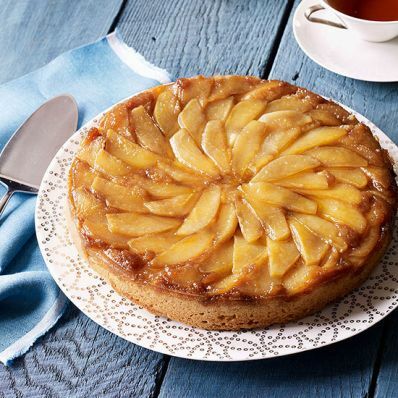 3 of 6 Fan slices of pear over sugar, with pointed ends toward center of pan, overlapping slightly. Set aside. 4 of 6 In a small bowl, whisk together flour, ginger, baking powder, salt and cardamom. With a stand mixer, beat softened butter in a large bowl until smooth. Add granulated sugar and beat 2 minutes, until creamy. Beat in eggs, one at a time, beating well after each addition. Beat in vanilla. 5 of 6 On low speed, beat in flour mixture, alternating with milk, beginning and ending with flour mixture. Spoon batter over pears and spread to pan edge with a spatula. Wrap bottom of pan with foil and bake at 350 degrees for 55 to 60 minutes. Test center of cake with a toothpick; if pick tests clean, remove to a wire rack. Cool 5 minutes. 6 of 6 Invert cake onto plate; remove side of pan. Carefully lift off pan bottom and cool cake to room temperature. Serve slightly warm with ice cream, if desired. Per Serving: 302 kcal cal., 11 g Fat, total, 62 mg chol., 186 mg sodium, 7 g sat. fat, 48 g carb., 2 g fiber, 4 g pro.